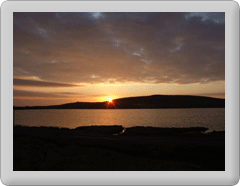 Zoom imageSunset over Brough Lodge Welcome to the website for the island of Fetlar. Our aim is to provide you with an interesting and informative experience, letting you learn more about our island and, hopefully, encouraging you to visit us on holiday or perhaps even re-locate here. For those visiting the island we would appreciate if you could complete an visitor survey available at various location on the island. 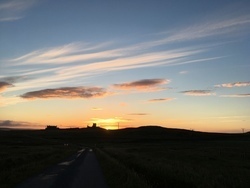 If you are keen to visit Fetlar, we provide information about attractions and activities, accommodation, transport, and more. Find out more at the 'Visit Fetlar' area. To see what sorts of things are happening in the community visit the new whats on page. Most social activities on the island take place at the local hall run by Fetlar Comunity Association. Planned activities are list in the "whats on" page. For those looking to move here, we’ve got information about housing, education or employment and much more. Find out more at the 'Move To Fetlar' area. If you've lived in Fetlar in the past, then the webcam might rekindle old memories. Even if you've never been here, the regularly updated images might give you an idea of what life is like here. (Please note we hope to have the new webcam back online shortly). In the meantime there are some stunning images and videos of Fetlar available at Fetlar Aerial. Whatever your interest in Fetlar, we hope you find this a useful and enjoyable place to visit. We will be working to continually add and develop this website over the coming weeks and months. Our aim is to keep you all up to date with the latest information about the island and the many ongoing projects we have. If you'd like to know about these developments, please sign up to our bi-monthly newsletter which will help give you a flavour of island life. The sign-up box is in the right column. To see a list of whats going on in Fetlar just visit our whats on page. We welcome feedback and your comments on the site would be appreciated. Simply contact us to let us know what is on your mind. Thank you for taking the time to visit and we hope to see you back here soon. *We are sorry for the prolonged outage on our webcam - we are hopeful of getting back online later this month (February 2015). Please check back for updates.